Barrett’s esophagus is a condition in which the lining of the esophagus changes, becoming more like the lining of the small intestine than the esophagus. 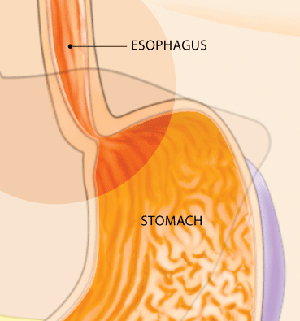 This occurs in the area where the esophagus is joined to the stomach. 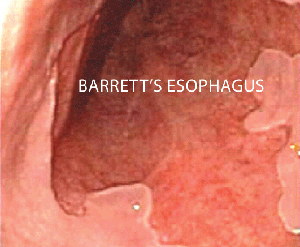 Barrett’s Esophagus occurs in the area where the esophagus is joined to the stomach. The most common symptom of GERD is heartburn, a condition that 20 percent of American adults experience at least twice a week. Although these individuals are at increased risk of developing esophageal cancer, the vast majority of them will never develop it. In a few patients with GERD (about 10 to 15 percent of patients), a change in the lining of the esophagus develops near the area where the esophagus and stomach join. When this happens, the condition is called Barrett’s esophagus. Doctors believe that most cases of adenocarcinoma of the esophagus begin in Barrett’s esophagus. Your doctor will first perform an imaging procedure of the esophagus using endoscopy to see if there are sufficient changes for Barrett’s esophagus. In an upper endoscopy, the physician passes a thin, flexible tube called an endoscope through your mouth and into the esophagus, stomach and duodenum. 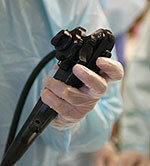 The endoscope has a camera lens and a light source and projects images onto a video monitor. This allows the physician to see if there is a change in the lining of the esophagus. If your doctor suspects Barrett’s esophagus, a sample of tissue (a biopsy) will be taken to make a definitive diagnosis. Both of these techniques allow the physician to view the end of the esophagus and determine whether or not the normal lining has changed. Only an upper endoscopy procedure can allow the doctor to take a sample of the tissue from the esophagus to confirm this diagnosis, as well as to look for changes of potential dysplasia that cannot be determined on endoscopic appearance alone. Barrett’s tissue has a different appearance than the normal lining of the esophagus and is visible during endoscopy. Barrett’s esophagus is twice as common in men as women. It tends to occur in middle-aged Caucasian men who have had heartburn for many years. There is no agreement among experts on who should be screened. 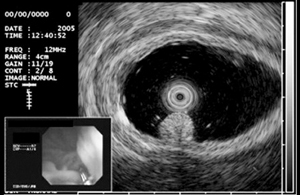 Even in patients with heartburn, Barrett’s esophagus is uncommon and esophageal cancer is rare. One recommendation is to screen patients older than 50 years of age who have had significant heartburn or who have required regular use of medications to control heartburn for several years. If that first screening is negative for Barrett’s tissue, there is no need to repeat it. There is a great deal of ongoing research in this area and so recommendations may change. You should check with your doctor on the latest recommendations. Medicines and/or surgery can effectively control the symptoms of GERD. However, neither medications nor surgery for GERD can reverse the presence of Barrett’s esophagus or eliminate the risk of cancer. There are some treatments available that can destroy the Barrett’s tissue. These treatments may decrease the development of cancer in some patients and include heat (radiofrequency ablation, thermal ablation with argon plasma coagulation and multipolar coagulation), cold energy (cryotherapy) or the use of light and special chemicals (photodynamic therapy). In some patients, endoscopic techniques to locally remove abnormal Barrett’s tissue may also be considered (for example, endoscopic mucosal resection). It is necessary to discuss the availability and the effectiveness of these treatments with your gastroenterologist to be certain that you are a candidate. There are potential risks from these treatments and they may not benefit the majority of patients with Barrett’s esophagus. There is much research being conducted in this area; you should talk with your doctor about the latest recommendations and guidelines. In high-grade dysplasia, abnormal changes are seen in many of the cells and there is an abnormal growth pattern of the cells. Low-grade dysplasia means that there are some abnormal changes seen in the tissue sample but the changes do not involve most of the cells, and the growth pattern of the cells is still normal. “Indefinite (or indeterminate) for dysplasia” simply means that the pathologist is not certain whether changes seen in the tissue are caused by dysplasia. Other conditions, such as inflammation or swelling of the esophageal lining, can make cells appear dysplastic when they may not be. It is advisable to have any diagnosis of dysplasia confirmed by two different pathologists to ensure that this condition is present in the biopsy. If dysplasia is confirmed, your doctor might recommend more frequent endoscopies, or a procedure that attempts to destroy or remove the Barrett’s tissue, or esophageal surgery. Your doctor will recommend an option based on how advanced the dysplasia is and your overall medical condition. If I have Barrett’s Esophagus, how often should I have an endoscopy to check for dysplasia? The risk of esophageal cancer developing in patients with Barrett’s esophagus is quite low, approximately 0.5 percent per year (or 1 out of 200 per year). Therefore, the diagnosis of Barrett’s esophagus should not be a reason for alarm. It is, however, a reason to have periodic upper endoscopy examinations with biopsy of the Barrett’s tissue. If you have Barrett’s esophagus and your first two upper endoscopy examinations with biopsies (performed about one year apart) do not show dysplasia, then upper endoscopy with biopsy should be repeated about every three years. If your biopsy shows dysplasia, then your doctor will make further recommendations regarding the next steps.